Are You Choosing Curiosity Over Being Right? Locating Yourself: Above or Below? We’re excited to support your success by sharing our content. Will you support ours (and more content creation!) by making a financial contribution? Read our content use policy. Share with us how you're using our content in your handouts, slide decks, videos, etc. Integrating one commitment is life changing. All fifteen together are revolutionary. That’s big talk, but these are big commitments. Distilled from decades of practice and experience with leaders around the world, you won’t look at leadership the same after this read. Add your email below and we'll send you the first chapter for free. "Practical, actionable and transformative. The 15 Commitments of Conscious Leadership is an invaluable tool for anyone who cares about leadership. A must-have resource." "Learning the skills in The 15 Commitments of Conscious Leadership has been one of the most important experiences of my life. It dramatically changed me as both a person and a leader." 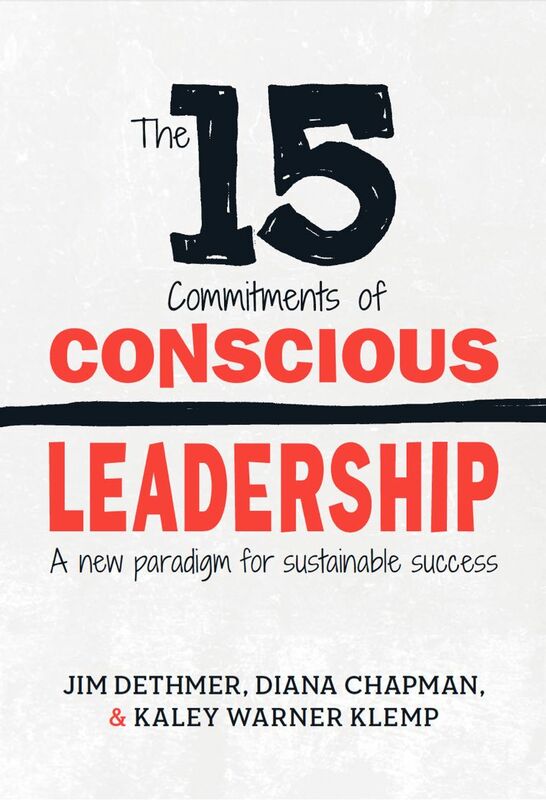 “The 15 Commitments of Conscious Leadership redefines what it takes to be a truly effective leader. Chapman, Dethmer, and Klemp offer a refreshing wake-up call to anyone who thinks that work is a self-driven, zero-sum game." "I am at the heart of the increasingly voluble discussion on "conscious leadership" and "culture" in dynamic companies. I have run companies, and I routinely advise early and mid-stage companies on practices to increase effectiveness and develop more transparent communication structures." This is an outstanding summary of what we know leaders to do to lead authentically and influentially. This book should be on the NYT bestseller list on the end cap at every airport book store. If leaders read and grasped this content workplaces would transform around the world and people would enjoy being at work.